In previous post, we discussed about web service handler. In web service handler rejected message is handled by web service. In this post we will discuss about next error handler which is Advanced Queue error handler. In Queue error handler rejected message is enqueued to advanced queue. Please note that your AQ table type is RAW type otherwise you will see below error. java.sql.SQLException: ORA-25215: user_data type and queue type do not match. Follow below steps to use Advanced Queue error handler for rejected file. 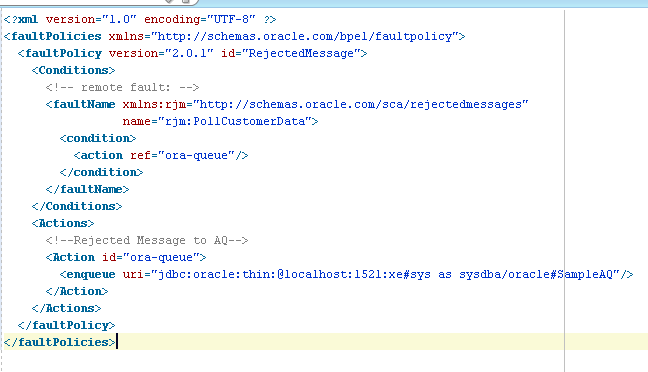 First you need to have advanced queue in oracle which will take the rejected message. 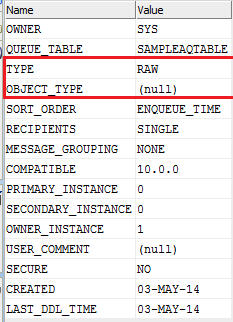 Refer my previous post where I explain how to create advanced queue in Oracle. For this post we will use below AQ and AQ table which we created in previous post. Put file corrupted file to polling location. You should see new entry in SampleAQTable. Next post explains about next error handler, File rejection Handler - Custom Java error handler for File Adapter.